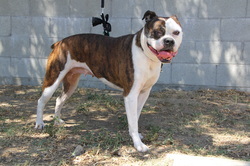 Athena is a beautiful 2yr old American Bulldog/Boxer mix that was recently added to our SACHI family. Sweet Athena was at the Baldwin Shelter and SACHI whisked her away to safety. There was no way we could leave her there never knowing what it’s like to be a loved and cherished member of a family and we’re so happy to welcome her! It’s only been a few days and we are still getting to know Athena but she makes us laugh and she loves her humans. She continues to blossom more and more each day. She’s as sweet as she is adorable. She loves to cuddle and give kisses. She is very curious and does not know her own strength. A simple cuddle can knock you over. She’s a little 60 pound tank full of love and kisses. She has met a few of her fellow SACHI four legged brothers and sisters. She has done pretty good and hasn’t shown any signs of aggression towards other dogs. We’re still getting to know Athena but so far she has been a very good girl. Some obedience training and work walking on a leash will do this cutie wonders, who still has some of her puppy energy. Please consider making Athena’s dreams about a forever home come true!